If you love clicking photos then you must ensure adequate safety for your camera. Nope, here I wasn't talking of the sentimental perspective. Your camera is actually very delicate in its structure, making it easily susceptible to physical and environmental damages. Neither she likes dust nor moisture. Definitely she hates being groped, dropped and undue exposures. So, be responsible and deal with her like you would do with a baby. Once you're a travel photographer, taking care of your photographic gears is a greater challenge. Least you can do for your camera is buying her a good quality bag/case. 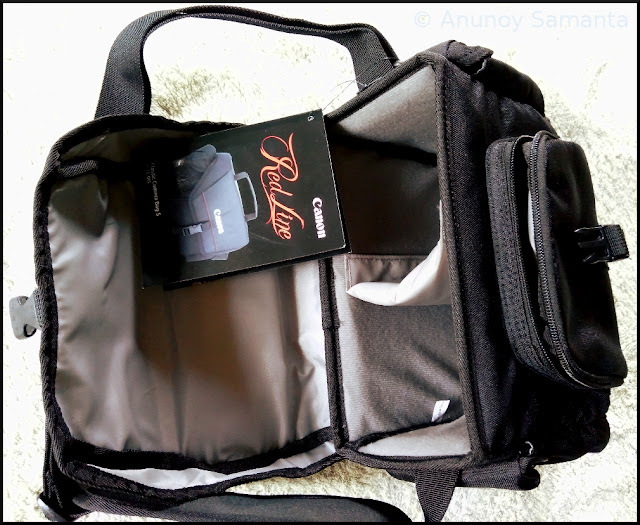 Right now I'm satisfied with the Tamrac and Hugger camera bags which I've been using for my point & shoot and DSLR cameras respectively. 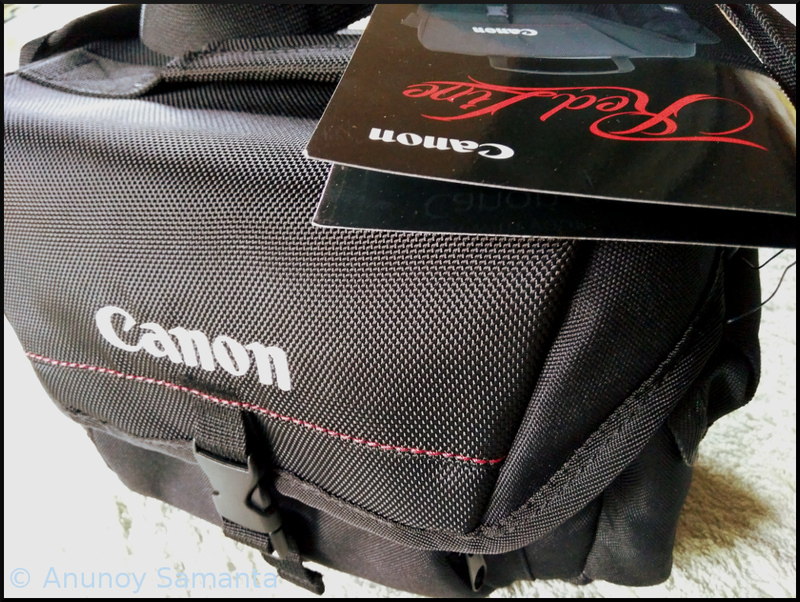 Few months back I had won a Twitter contest by Canon India and they shipped me this camera bag (Model: Canon Red Line Classic Camera Bag S RL CL-01S) as prize. I explored this youngest (price wise) member of Red Line range to find out how much usability and relevance factor Canon has endowed it with at a price point of 1,799 INR. The synthetic built material looked robust indeed and gave me a feeling of being water resistant to a large extent. While you are traveling, most of the times you might be aware of your surroundings, but trust me there'll be moments of utter surprise. I vividly remember, three years back when I was boating on the apparently calm water of Arabian Sea during a trekking expedition at Goa, a wave of brine rose from nowhere beside my boat and washed me in a second from head to toe! It was quite thrilling indeed but the moment I felt a tug around the neck, my whole thought dashed into the wet camera bag. I didn't dare to breathe till I found my camera totally dry and safe inside its wet bag. Yes, that's how a proper camera bag can save your day. Canon Red Line Classic Camera Bag S is meant for those photo enthusiasts who do not prefer to carry their entire photographic world with them. Personally I feel it has been designed for exclusively for snappers passionate about clicking photos on the go. Red Line Classic Camera Bag S is a compact and lightweight (just 340 g) simple shoulder bag made up of polyester, having a main top-loading compartment which is subdivided into two adjustable compartments separated by a removable velcro pad, and three (one front and one on each side) more pockets for small camera accessories. I would prefer to put my DSLR and the point & shooter side by side onto this main compartment while filling up those other three pockets with extra batteries, memory cards and filters. In an otherwise minimalist design, the unique red stitch line (probably to keep up with its variant name "Red Line") and the prominent Canon branding occupying the front may resonate with the liking of Canon fans, but for other photographers these are nothing better than sugarless candies. The synthetic built material looked robust indeed and gave me a feeling of being water resistant to a large extent. Other than the small front pocket the Red Line Classic Camera Bag has no other zip in any of its compartments. Although well-covered and secured with a plastic clasp, the lack of zipper in the lid of main compartment makes us doubtful about its dust resistance. The padding is okayish at its best. Call me paranoid, but, I'll certainly choose my existing DSLR bag over this Red Line boy if I am venturing out for a long motorcycle trip. In the top-loading main chamber you can freely place your SLR camera body mounted with a lens (mind it, I'm not talking of those giant telephoto lens) and an additional lens. 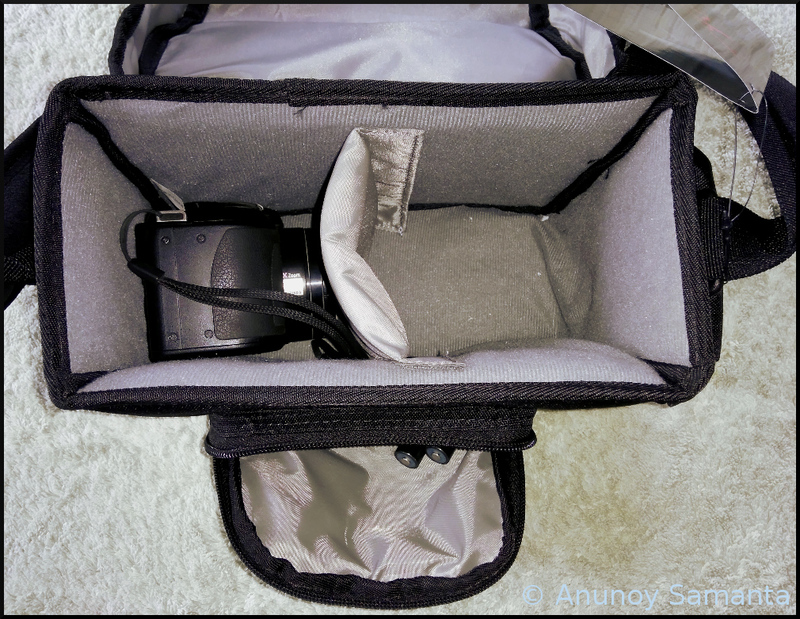 For point and shooters like me who are less interested in changing lens, you have a large compartment to fill with whatever important stuff you want beside your point & shoot camera. I would prefer to put my DSLR and the point & shooter side by side onto this space while filling up those other three pockets with extra batteries, memory cards and filters. After all, the Red Line Classic Camera Bag S was not intended to accommodate anything more than that. Shoulder strap is simple but reliable enough to hold what it's supposed to carry without hurting your body. The unique red stitch line and the prominent Canon branding occupying the front may resonate with the liking of Canon fans, but for other photographers these are sugarless candies. - No nonsense minimalist design and lightweight. 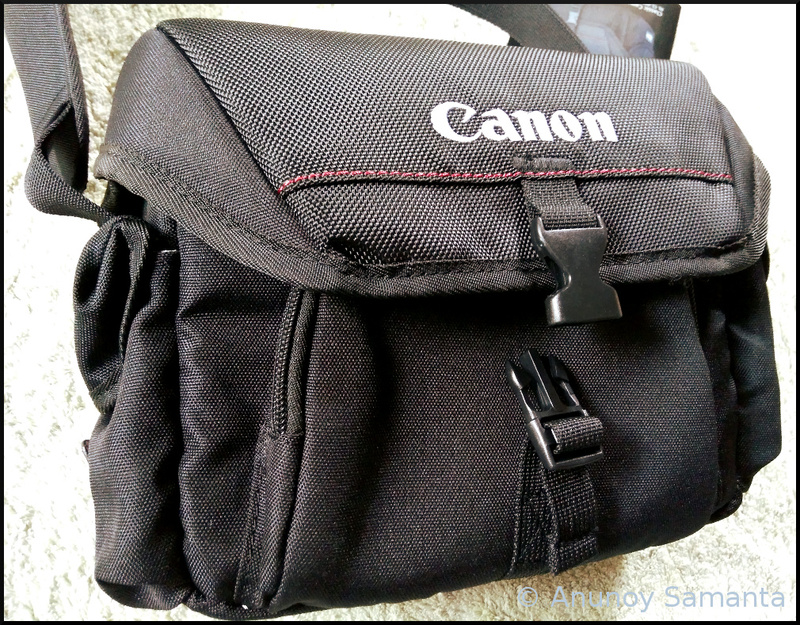 Final Verdict for Canon Red Line Classic Camera Bag S: Not value for money. Located in East Medinipur district, barely 110 kilometers away from the state capital, Geonkhali is one of the few less sung tourist destinations of West Bengal despite its adequate potential. Geonkhali is a riverine village blessed with the confluence of three rivers- Rupnarayan, Damodar and Hooghly. Dotted with moving vessels of various capacities, the confluence at Geonkhali offers such a vast aquatic vista that a tourist would surely find it difficult to appreciate it as anything less than a mammoth lagoon, if not sea. However scenic it sounds geographically, the lack of proper tourism infrastructure and low entertainment quotient has kept the popularity of Geonkhali limited to mostly local picnic-goers and hand few enthusiastic travelers looking for offbeat weekend destinations. Geonkhali is just 30 kilometers far from Haldia, so, for me it was a lazy afternoon ride. As you reach Geonkhali you'll find two rustic jetties opposite to the Triveni Sangam Tourism Complex, the only decent accommodation option for overnight stayers. Don't get too excited. Both of those jetties are locked, probably to save overzealous tourists from drowning. Logical mind told me that there was nothing to gain from the feat, yet I chose to break bad and trespassed the jetty (not at all recommended) with my camera. Standing at the edge, definitely it felt better to be surrounded by water from all sides but there was no extra-picturesque panorama to capture. After clicking few shots I switched off the camera and kept enjoying the river breeze while gazing at the buffy water of the confluence till the official guard came screaming to chase me out of the forbidden platform. Till few months back there used to be official boating facilities for tourists which got suspended after an unfortunate incidence of drowning. Occasionally local fishermen dock their fishing boats near the jetty with expectations of getting chartered by tourists. If you're lucky enough you might strike a good deal and enjoy cruise over Rupnarayan on a simple country boat. Otherwise relax over the grassy bank and keep spotting ships at regular intervals sailing towards or away from Haldia Port. Other than rooms for lodging and the river-view restaurant, Triveni Sangam Tourism Complex also houses garden for picnic groups and children's park. I could only fantasize how ethereal the vast water body would look from the first floor window in a full moon night! I've no idea of their rooms or quality of service they provide though. Once you are fully wet with the typical ambiance of rural Bengal and done with vessel spotting over the wide river, you don't have much to do at Geonkhali. There are few wrecked vessels stuck by the muddy riverside which you can easily see from the main road. Local people have left very little inside them, yet they can be your worthy subjects for travel photography. Exploring rusted interiors of those deserted metallic monsters was quite an interesting and unique experience. The day was bit overcast. The much anticipated picture-perfect Sunset over Rupnarayan River was not on my travel fate. I think you would love traveling another 10 kilometers to visit the Mahishadal Rajbari (new palace). But, do not miss the less known Mahishadal Singhaduar Rajbari (the old palace) which is at a close proximity to the new palace. There you'll get to see few old Hindu temples. I had been there twice before. So, I chose to bid a twilight adieu to Geonkhali and start my return ride for Haldia. Did you find the post title intriguing? Well, the credit goes to Bihar Tourism. Otherwise, I was okay with something more simple like- Ride to Bodh Gaya. Hardly a month back, I had happily bid goodbye to 2015 with my solo ride to Daringbadi - the "Kashmir of Odisha". As you finish a chapter it becomes your obligation to begin a new one. Like an alcoholic looks out for the last drop in his empty liquor bottle, a motorcycle tourer lives with the same desperation to find occasions to escape from his monochromatic cage and touch the tarry path. I see people complaining about lack of time, company or budget when it comes to traveling. Truth is, it's all about that priority list you maintain consciously or subconsciously. Winter doesn't last longer than three months where I live. As the February slips away plains of Eastern India start rehearsing for the upcoming summer. The weather remains no more biker-friendly. If you're planning to ride a part of the Golden Quadrilateral November to February should be the season of choice. Usually I ride solo. So does my brother. We have separate things to take care of which makes teaming up less feasible. Last time we made a motorcycle trip together has become a three and half years old tale. Since my Daringbadi trip we had been trying to work out on a long ride. Varanasi was in our mind but it required more days than we could afford. Just touching such an interesting site as Varanasi and riding back home without exploring the essence of that ancient city seemed utterly meaningless. After a lot of hypothesis testing we chose Bodh Gaya- the place where Buddha had attained enlightenment. Arid Falgu River accompanied us for almost our entire ride to Barabar Caves. Day 1) Ride from Bardhaman to Bodh Gaya. Overnight stay at Bodh Gaya. Day 2) Visit to Mahabodhi Temple Complex. Ride to Barabar Caves and return to Bodh Gaya for overnight stay. Day 3) Ride to Kakolat Falls and return to Bodh Gaya for local temples/monasteries visit. Overnight stay at Bodh Gaya. Day 4) Return ride from Bodh Gaya to Bardhaman, hoping that our motorcycles had obtained enlightenment and salvation. A Buddhist devotee chanting inside Mahabodhi Temple complex. Whether you're driving from Delhi side or Kolkata, you have to take diversion at a point from NH-2 to Gaya-Dobhi road. The road at the diversion point is too broken to impart any positive impression of Bihar Tourism among thousands of foreign pilgrims visiting Bodh Gaya daily. Merely putting up few catchy hoardings by potholed roads, and neatly maintaining "Incredible India" labeled Volvo buses won't really be enough to manipulate foreigners in the way they imagine India. Located by the bank of Falgu River, Bodh Gaya is a tourist friendly town in Gaya district in the Indian state of Bihar. It was in Bodh Gaya where Prince Siddhartha Gautama obtained enlightenment after meditating under the Bodhi Tree for a night and became Lord Buddha. For this obvious reason Bodh Gaya is one of the most significant sites of the Buddhist Circuits (Other major three places are- Lumbini, Saranath and Kushinagar). The 80-feet Buddha Statue at Bodh Gaya. As you reach Bodh Gaya you'll be greeted by rows of hotels and religious institutions. I was expecting to find our accommodation in any monastery so that we could experience the spiritual ambiance associated with the place. Sun was setting down and few initial rejections in monasteries made me reconsider staying in a guest house. Many religious institutions prefer giving accommodation only to a group of tourists than an individual or two. Moreover it was the peak season for pilgrims. If we searched harder I believe we could squeeze ourselves in somewhere, but after 400 kilometers of ride in a 125 cc motorbike I didn't have the required juice. On a brighter note, even in peak tourist season at Bodh Gaya you can get plenty of lodging options. There are hotels, lodges and guest houses of different budgets to suit the budget of every category of travelers. For backpackers and shoe-string budget travelers I would suggest to head beyond the Mahabodhi Temple area, and as you cross the Vietnamese Temple you'll find a lot many guest houses offering rooms in as low as 250 bucks! Kakolat is a 160 meters high waterfall located on Bihar-Jharkhand border. The Mahabodhi Temple is the hub for Buddhist pilgrims and other tourists at Bodh Gaya. This temple built in 260 BC, presently an UNESCO World Heritage Site is located in a huge campus called Mahabodhi Temple Complex which also houses the holy Bodhi Tree and other spots of religious (Buddhism) significance. This is the site where Buddha had attained Nirvana. We spent the first half of our second day morning at Bodh Gaya exploring the spiritual air around the Mahabodhi Temple. It is a high security zone under the strict surveillance of army (or, might be para-military) as well as Bihar Police. There is no entry fee but an entry with your still camera would cost you 100 bucks. Mobile phone is not allowed inside the main temple complex. Everything is so damn unique and ethereal in the Mahabodhi Temple! Despite the thick volume of devotees you won't feel the mad-crowd-rush. Everyone is doing something (circumambulating, praying, chanting, meditating etc) of his/her own in all different styles, and yet, everything is in perfect harmony, without the slightest smell of chaos. I would rather share my experience of visiting the Mahabodhi Temple in a separate blog post. Barabar caves are are the oldest rock-cut caves in India you can find till date. Having tried Japanese cuisine for last night dinner, we decided to savor Tibetan breakfast before leaving Bodh Gaya for Barabar Caves. Barabar caves are are the oldest rock-cut caves in India you can find till date, surviving from the Mauryan Era, located some 42 kilometers from Bodh Gaya. Four caves- Karna Chaupar, Lomas Rishi, Sudama and Visva Zopri are collectively called Barabar Caves. G-Map navigation helped us in finding our route most precisely. Arid Falgu River accompanied us for almost our entire ride. After a considerable stretch of ride on well maintained SH-4 we had to cross the wide sand bed of Falgu, and thereon off-roading started. Next day we locked Kakolat Falls as our riding destination. Kakolat is a 160 meters high waterfall located on Bihar-Jharkhand border, approximately 100 kilometers away from Bodh Gaya. It is not only the natural beauty of Kakolat Falls that attracts tourists from faraway places but also the local belief that the water of this falls has medicinal value of curing any disease. During Sankranti time an annual fair is organized around the falls and the presiding deity is worshiped with great devotion. The last 15-20 kilometers of the ride was nothing short of dirt biking which we not only survived, but also fully cherished. The caretaker, Yamuna told us that during summer days the water of Kakolat becomes icy cold! Perhaps, narrating about Barabar caves and Kakolat Falls in a separate post will be more justified. Inside the Japanese Temple, Bodh Gaya. Resting somewhere on NH-2, on our ride back home... The Journey never ends.